A new study confirms what many people of color have known for years: black drivers are far more likely to be stopped by police in Grand Rapids than white motorists. Now, city officials and community leaders are planning for widespread systemic change to address racism and racial bias in law enforcement. When city officials this week released the results of a traffic stop study that showed black drivers are twice as likely to be stopped by police in Grand Rapids than white motorists, many residents of color said: We’ve known this for decades. We’ve been saying this for decades. Why haven’t you been listening? “After all these years that African Americans and people of color have been saying there’s racial profiling, what is the city of Grand Rapids going to tell people who’ve been saying this for the last 40, 50 years?” Kent County Commissioner Robert Womack asked during a community meeting held at Linc Up Tuesday evening to discuss the results of the city-commissioned traffic stop disparity study. The study, requested by the city last year as part of a 12-point plan to strengthen relations between the community and police, included the examination of three years’ of traffic stop data, from 2013 through 2015, at 20 intersections throughout the city. [You can read the entire 100-page traffic study here.] In addition to finding that black drivers were twice as likely to be stopped by police in 2015, the study showed police searched black motorists far more than white drivers after the motorists had been pulled over. In 2013 and 2014, black drivers were 1.85 times as likely to be stopped. Hispanic drivers were also stopped at higher rates in Grand Rapids. On average, Hispanic drivers were, compared to white drivers, 1.3 times more likely to be pulled over in 2015, though there were intersections where Hispanic motorists were stopped far more. At 28th and Breton, Hispanic drivers were twice as likely to be pulled over, and they were 1.7 times as likely to be stopped at Leonard and Turner. White drivers were often “under-stopped,” meaning police pulled them over fewer times than what would be expected when considering the number of white motorists on the road. A crowd of people gathered Tuesday evening at Linc Up for a public meeting about the traffic study.At 19 of the 20 intersections in the study, black drivers were more likely to be pulled over, with some of the most problematic intersections being: Bridge and Stocking, Leonard and Turner, Franklin and Eastern, Eastern and Hall, and Alpine and Leonard. At each of these locations, black drivers were pulled over at rates of more than double that of white motorists. Bridge and Stocking faced the greatest discrepancies, with the study showing black drivers were stopped close to three times (2.77 times) more than white motorists. Grand Rapids City Manager Greg SundstromAs part of “owning” the study’s results, city and police officials said they plan to annually analyze traffic stop data for years to come in an effort to entirely eliminate racial bias from the city’s policing. “Why we didn’t wake up and listen to you before, I don’t know,” Sundstrom said in response to Womack’s question during the meeting at Linc Up. However, the city manager promised, the city is taking on racial bias, in its police force and throughout city government. 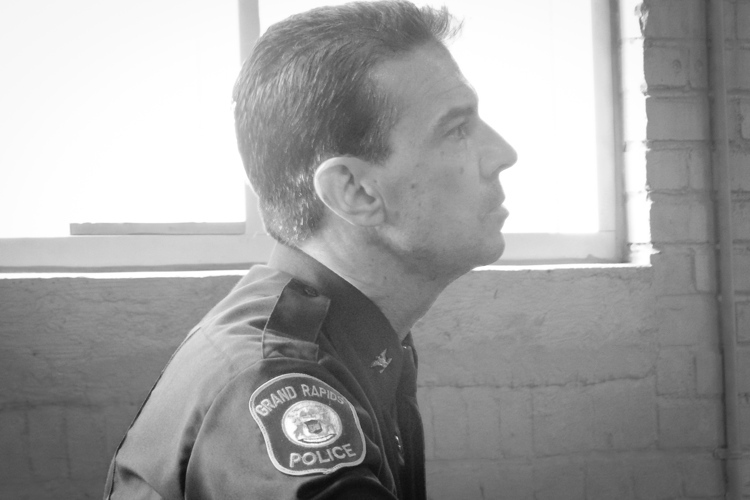 GRPD Chief David Rahinsky said the department, which received the results of the study the same day as the public,Tuesday, would not turn a blind eye to the findings. Police Chief David Rahinsky at the Linc Up meeting.“What you won’t hear are excuses from the police department. We take ownership of this,” said Rahinsky, who, along with Sundstrom, pointed out that the GRPD recently has been attempting to address racial bias in the police force and tensions between police and the public, particularly with communities of color, through such efforts as purchasing body cameras for officers, hiring its most diverse class of police recruits in GRPD’s history, and implementing implicit bias training for police, among other initiatives. But, residents said, more needs to be done to address the racism and biases within the police department, and the city in general. Following the unveiling of the report’s findings on Tuesday, city officials and the Grand Rapids Police Department held five public meetings, two on Tuesday and three on Wednesday, to discuss the study. 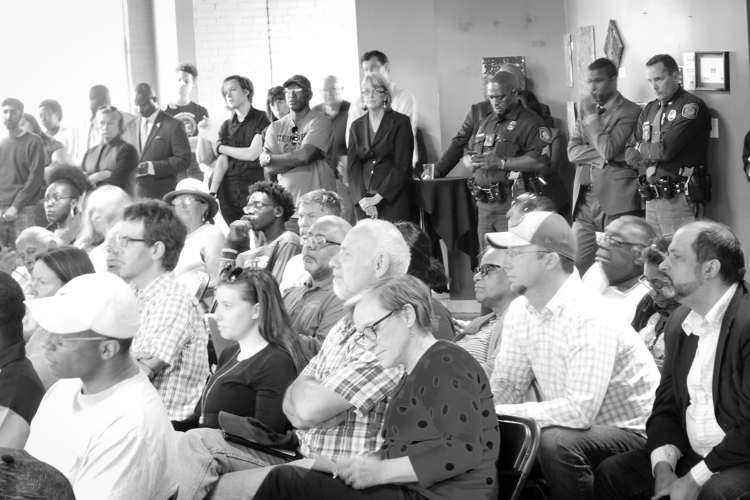 More than 100 people gathered for the first meeting at Linc Up, and numerous individuals who spoke during the gathering expressed anger and frustration with the findings that confirmed what many already knew: there is a racial bias in policing in Grand Rapids. “I think this study validates what a lot of people of color in our community have been saying for a long time,” Linc Up Executive Director Jeremy DeRoo said at the public hearing. DeRoo, along with numerous others who spoke during the hearing, asked if the police department would implement an implicit bias test, not just training, for officers. Rahinsky responded that he does not believe implicit bias tests are “scientific,” but John Lamberth, of Lamberth Consulting, said he disagreed with the police chief. “It is a reliable test,” Lamberth said of the Implicit Association Test [which you can take online here]. Washtenaw County Sheriff Jerry Clayton, who worked on the traffic study.Washtenaw County Sheriff Jerry Clayton, who worked with Lamberth on the study, discussed the study's 12 main recommendations for further action by the GRPD and city officials, including: analyzing GRPD’s stop and search data for 2016 traffic stops, publicizing stop and search data over the next four years, beginning a comprehensive review of GRPD policies and procedures, reviewing data collection efforts to ensure the recording of relevant data, and making sure staff is trained in bias-free policing. Other recommendations are: assess and evaluate the GRPD’s early warning system to determine which officers may be stopping and/or searching motorists of color at a higher rate than their peers, continue to bring officers and the community together to discuss community and police relations, regularly survey the community about the police, and within six months report to the community on action taken as a result of the traffic stop study. “This is unacceptable, and it must end,” Sundstrom said, referring to the study's findings. “This is contrary to the values of our community. The city holds racial equity as our highest priority, and we will place great urgency on this mandate to address the inequities and disparities in our traffic stops and policing practices. In addition to adopting many of the recommendations made in the report, we will also begin a critical review of the police department’s policing practices to eliminate racial bias." The study’s findings come at a particularly fraught time for police-community relations. At the end of March, five unarmed African American boys were stopped at gunpoint by police, an event that has sparked deep outrage and concern among the community at large, including residents of color who say they often fear for their lives when dealing with police. The results also follow a number of recent fatal police shootings of people of color, including Philando Castile, a 32-year-old black man who a police officer fatally shot after pulling Castile over in Falcon Heights, suburb of St. Paul, Minnesota, in July 2016. Castile was shot and killed while in the car with his girlfriend, who filmed the incident in a video that went viral and sparked international outrage over police brutality, and his girlfriend’s 4-year-old daughter. For Castile, and so many people of color around the country, traffic stops were, as this article puts it, a routine part of his driving life. According to an NPR analysis of Castile’s driving records, Castile was stopped by police 46 times. He certainly has not been alone in this. Studies from Chicago to Connecticut, and in other cities and states throughout the U.S., have shown people of color are pulled over with far more frequency than their white counterparts. Once people of color are pulled over, research has shown they are more likely to be searched and arrested than individuals who are white, despite the fact that they are not carrying contraband items more than their white counterparts. In a number of studies, research found that, when police searched white drivers, they were more likely to find guns and drugs than with drivers of color. In addition to the data about stops in Grand Rapids, the traffic study reported that black drivers are searched far more than white motorists. In 2015, black drivers in Grand Rapids were 2.5 times more likely to be searched for “probable cause,” which is a decrease over 2013 and 2014, when black motorists were 3.97 and 3.07 times more likely to be searched. As with other national data, the Lamberth study reported drivers of color were no more likely to be carrying contraband than white motorists. And Hispanic drivers were less likely than other drivers to be carrying illegal items, Lamberth noted. One man whom we interviewed following Tuesday’s meeting at Linc Up, who asked we not use his name for fear of retaliation by the police, said he automatically calls his brother any time he is pulled over because he is afraid of being shot. Others at the meeting too spoke about the fear they will feel when being pulled over, with several people citing the killings of Castile, Sterling, Eric Garner, and Michael Brown -- all black men killed by police -- in interviews with Rapid Growth following the meeting. In Grand Rapids, as in cities across the country, the relationship between communities of color and law enforcement has been a deeply problematic one, with black residents long facing racism in such institutions as housing (landlords would frequently force black residents to reside in run-down structures, as author Todd Robinson writes in his book, “A City Within A City: The Black Freedom Struggle in Grand Rapids, Michigan), employment, restaurants, education, and more. But black residents found little support for addressing these issues through formal law enforcement or legal systems. Black residents also witnessed support from law enforcement for racist organizations, such as the KKK, which held a procession in downtown Grand Rapids on July 4, 1925, Robinson writes. The distrust that ensued among people of color continues to resonate in West Michigan, and panelists at a forum held last year by Black Women Connect GR said that they have long attempted to avoid interactions with police out of fear. Panelists noted that their parents gave them, and they’ve given their children, what is known as “The Talk,” a plan that essentially lays out what youth, and adults, of color need to do during police interactions to remain alive, as well as how to avoid police in general. “For the past 30 years, it’s been a life’s mission to keep my children safe,” Tamika Henry, an educator in the Allendale Public Schools, said at that forum. 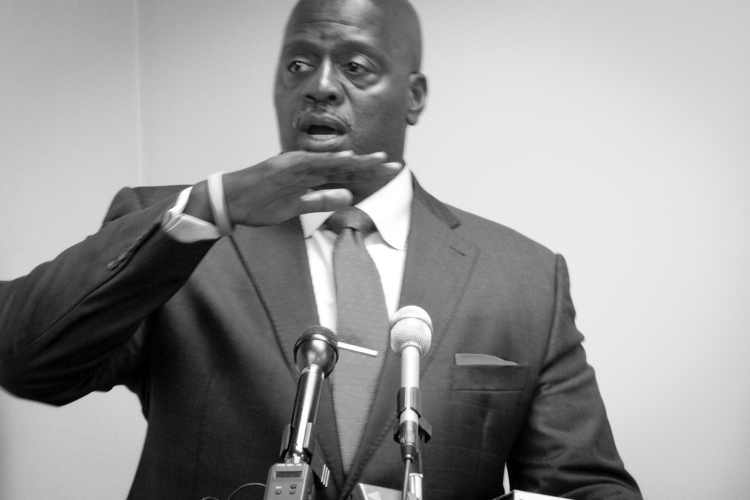 “When you live at that heightened level of stress, it’s really unhealthy,” Henry continued, referring to the constant stress parents will feel regarding children of color being pulled over by, or otherwise encountering, police, something which numerous speakers at forums around the city have stressed. 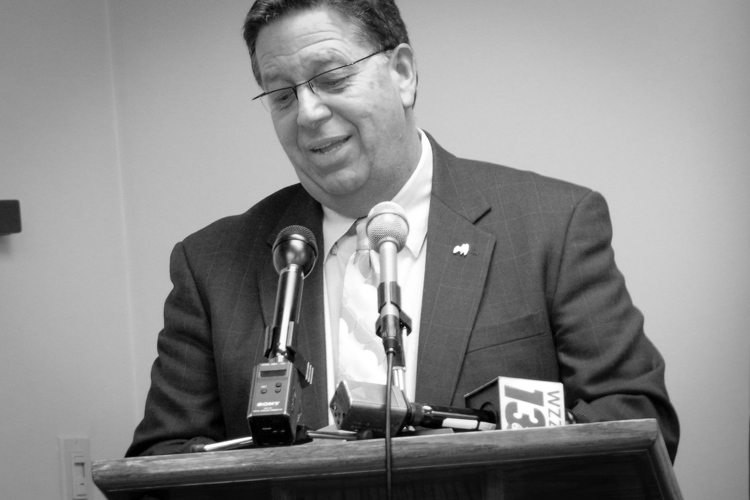 Citing the 2014 death of Michael Brown, an unarmed black teenager who was shot and killed by Darren Wilson, a white police officer, in Ferguson, Missouri, as a “watershed moment” for law enforcement, Rahinsky said the GRPD has done, and continues to do, some serious soul searching to root out racism and racial bias in the department. In order to address racial bias in the police department, Mari Beth Jelks, the managing director of administrative services for the city of Grand Rapids who served as the study's main point person for the city, urged residents to get involved. “It’s your job to hold us accountable and to help us with strategies and solutions; that’s how democracy works,” Jelks said. To find out more about the traffic study, and to read the entire 100-page report, you can go here.